This adorable cake idea came straight from a German cooking magazine. The cake is fairly easy to make, however, it needs to stand in the refrigerator for at least two hours before serving so take that into account. The cake consists mostly of a chocolate cake layer, whipped cream, and fresh bananas. 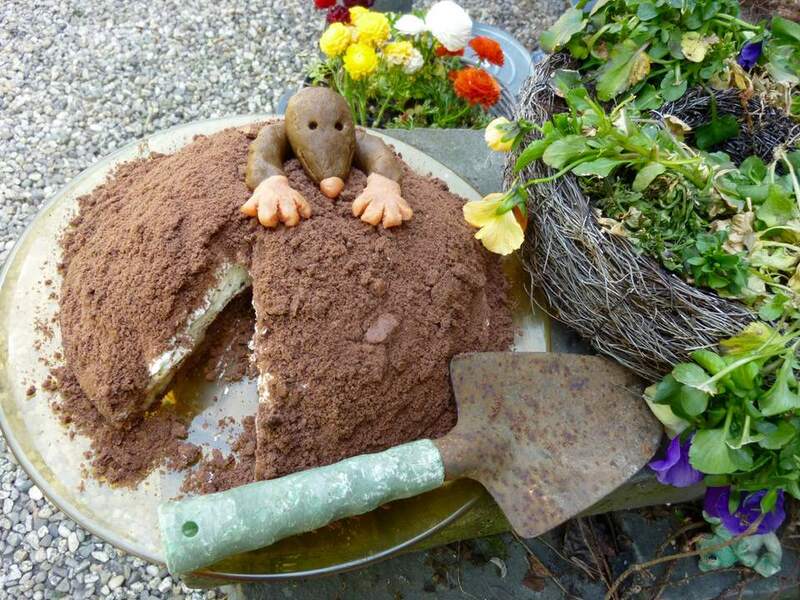 The mole can be sculpted out of marzipan or fondant. Recipes for homemade versions of both are included below. You can also use store-bought marzipan or fondant. If you don't want or have time to sculpt a sugar mole, another decorating option is to scatter store bought royal icing flowers over the top of the finished cake. Note: while there are multiple steps to this recipe, this edible mole dessert is broken down into workable categories to help you better plan for preparation and baking. Fit your mixer with the dough hook attachment, Cover the inside of your mixer bowl and the dough hooks with Crisco or shortening. Then also grease a heat safe bowl and a wooden spoon. Place marshmallows and water in the bowl. Microwave the marshmallows for 30 seconds at a time stirring the mixture in between with the wooden spoon. When the mixture is the consistency of Marshmallow Fluff, transfer to the mixer and add 2 cups of the powdered sugar. Continue adding powdered sugar as the mixer works, one cup at a time until fondant forms. Cover your work surface with your hands with Crisco or shortening. Dump the fondant on the greased surface and knead the fondant until all the sugar disappears. Wrap in plastic wrap until you use it. Divide into sections and knead in paste food coloring. If you are using almond flour, skip the next two steps. Pulse the blanched almonds and a tablespoon of powdered sugar in a food processor until they are completely pulverized. The powdered sugar will prevent the almonds from becoming a paste. Add the powdered sugar to the food processor and pulse until the almond meal and powdered sugar are combined. I like to take out the blade and use a whisk to break up any lumps that have formed and then replace the blade and pulse a few more times. Add the pure almond extract and the rosewater and pulse until combined. Add the egg white and pulse until the mixture becomes smooth. Remove the mixture from the processor and knead in the food color. If the mixture is too wet and sticky, sprinkle powdered sugar over the mixture a bit at a time to knead it in and make the marzipan stiffer. If the mixture is too dry, knead in a few drops of the light corn syrup. Grease a 10-inch springform pan. Beat the unsalted butter and white granulated sugar with the whisk attachment of the mixer until fluffy. Add the eggs one at a time and combine thoroughly. Add the all-purpose flour, baking powder, cocoa powder and pinch of salt. Mix to combine thoroughly. Transfer the dough to the greased springform pan and bake for 30 minutes or until a knife inserted into the center of the cake comes out clean. Transfer the cooled cake to a serving plate. Use a spoon to create a hole in the middle of the cake, digging about two inches deep. Be sure to leave an untouched 3/4-inch frame around the sides. Collect the discarded cake pieces in a bowl and crumble them into a fine texture. In a small bowl whisk together the cornstarch and powdered sugar. Beat the cream with a whisk attachment. Add the teaspoon of pure vanilla extract and slowly add the cornstarch, powdered sugar mixture. Stop beating the cream when stiff peaks form. Fold in the mini chocolate chips or shaved chocolate pieces. Peel and slice the bananas into disks. Lay them down forming a layer inside the hollowed out cake frame. Spread the whipped cream onto the cake forming a dome. Sprinkle the reserved cake crumbs over the cream dome to cover it completely. Make sure no white is showing. Place the cake in the refrigerator and let it stand for 2 hours. In the meantime, make the mole. Pinch off a piece and roll into a ball, then form a pear shape. Use a toothpick to poke holes in for the eyes and run a line around the pointed part of the pear shape for the mouth. Roll the rest of the brown colored marzipan between your hands to form a U shape. Place the head on top of the U shape with the nose pointing between the two sides of the U. Color small handful of marzipan pink. Roll a small ball and attach to the pointed part of the head to create a nose. From the hands and attach to the ends of each arm of the U-shape. If you have a very small flower cutter, you can use this to cut out the hands. Remove the cake from the refrigerator. Place the mole on top of the cake and gently push it into the cream to secure it. To blanch raw almonds, boil them in water for one minute, rinse immediately in a colander with cold water and squeeze the skins off with your fingers. They will slip off easily. Wrap leftover fondant tightly in plastic cling film and store in a zip lock bag until ready to use.